What is the step by step way to send goods from India to Switzerland? How to export from India? What is the process to be followed in India to export to Switzerland? Procedures of export certification, registration, customs formalities etc to export from India to Switzerland. The information given here is about process to export from India to Switzerland. There are many types of goods exported from India to Switzerland. The export formalities and procedures are usually common in almost all countries. The main commodities exported by India to Switzerland are textiles and garments, leather products, shoes and shoe uppers, cotton, plastics, organic chemicals, precious stones and jewellery, dyestuffs, machinery and parts, coffee, tea, and hand-knotted carpets. Export process from India to Switzerland and other countries is almost same worldwide. Detailed information on how to export from India is explained in detail as separate post in this website. Click below to read the same. 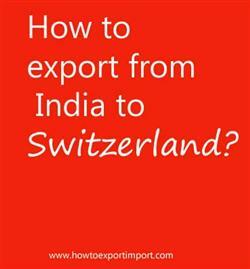 The process on how to export from India to Switzerland is explained here. Would you like to add more information about the procedures and formalities to export from India to Switzerland? Share below your comments about this post on how to export from Indian to Switzerland. Procedures to export from Agatti to BASEL (BASLE) Need to export from Bangalore to ZURICH. Explain to export from Bhopal to GENEVA. How to export from Ahmedabad to ZURICH? Formalities to export from Amritsar to GENEVA. Information to export from Bhubaneswar to BASEL (BASLE). Step by step process to export from Chennai to ZURICH. Methods to export from Chandigarh to GENEVA. Procedures required to export from Delhi to BASEL (BASLE)Requirements to export from Goa to ZURICH. Clarifications to export from Guwahati to GENEVA. How can I export from Hyderabad to BASEL (BASLE. What should I do to export from Indore to ZURICH. Guidelines to export from Cochin to BASEL (BASLE). Please guide to export from Coimbatore to ZURICH. Help to export from Daman to GENEVA. CGST Act Section 33 Amount of tax to be indicated in tax invoice and other documents.